The first volume of A Song of Ice and Fire, the greatest fantasy epic of the modern age. Summer spans decades. Winter can last a lifetime. And the struggle for the Iron Throne has begun. As Warden of the north, Lord Eddard Stark counts it a curse when King Robert bestows on him the office of the Hand. His honor weighs him down at court where a true man does what he will, not what he must...and a dead enemy is a thing of beauty. Yes...by now, most of you have no need for a review of a book as old as A Game of Thrones. And for those of you who haven't read the books, I'm sure you have seen the ridiculously popular television series on HBO. But you know what? It has taken me weeks to finally finish reading this book, and by god, I am going to review it! Now, I have yet to watch the actual television series, but I have heard SO much hype about the show that I finally wanted to jump on the bandwagon. Of course, being the word-nerd that I am, I was determined to read the books first. Let's be real, though -- I am a working woman with two kids....this book is 800 pages long. So if I've been MIA for a while, now you know why! My review: this book is incredible! And it's one of the only novels of this length that has ever had me glued to the page. There was killing. There was betrayal. There was family drama, friendship drama, royal drama -- I mean, it was like reading a good telenovela with no end in sight. If you've seen the show, than I heard they stick pretty close to the books. If that's true, I don't know if I'll ever watch it because there are some scenes in there that are more gruesome than some horror movies I've seen. I actually had to re-read sections of the book because I was in utter shock that anyone could write such tragic ways to die. I would seriously urge everyone to give these books a try. In the beginning, it's hard to keep up with the sheer number of characters and names (at one point I counted 8 different names on a single page), but eventually you start learning who's who and it just enhances your experience even more. Awesome review of GoT! I watched the first 3 seasons before I read any of the books (and the show stays very true to the books) and I believe that helped me with character association and understanding what was going on because to be honest the first few hundred pages was tough! I'm in the middle of the fourth book now and still loving it. I hope you continue with the series! I am completely in love with this series! I'm all caught up now, so the wait for the next book is pretty much torture. Some of my favorite character's lives are very much in question right now and it's killing me. I've read the first 3 in this series and LOVE it! 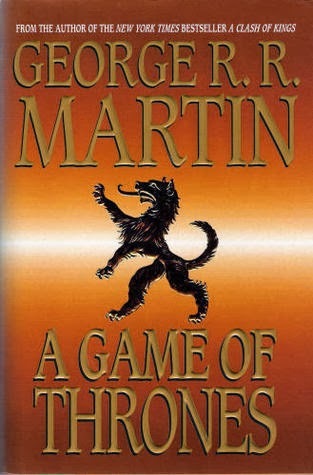 As the first novel in the ASoIaF series, this book overflows with drama and suspense in a fantastical universe with strangely familiar political, social and religious themes. There is adventure, tragedy followed by momentary relief, deceit and corruption, bravery and mysticism and horror, love and loss and everything in between, with never a monotonous sentence to break the flow. Enjoy the mixture of epic fantasy with gritty realism but beware - Westeros is no Middle-earth. The book was delivered in perfectly good condition with plastic wrapping and new-book scent intact (and the low price doesn't hurt!). Thanks people! Yes i not read this book..but i have to saw the actual television series on HBO.. !! !